Liquid Liquid – LILY & GENEROSO 4EVER! Upon picking up Here, I admittedly knew nothing about Richard McGuire, and I suspected there was another reason why our dear friend Chris sent over this graphic novel beyond its content. Once I finished this brilliantly minimalist work, I reached the sleeve insert on the back cover, which revealed Chris’s motivation behind this gift and an insight into the tone and style of the novel: Richard McGuire founded Liquid Liquid, one of my favorite New York No Wave/Disco Not Disco bands. With this enlightened knowledge of McGuire’s musical history, a sudden clarity on the intention and the voice of the novel struck me. Like Liquid Liquid’s musical construction, destruction, and reconstruction of familiar themes and rhythms, Here combines familiar motifs and settings to create an overall mood of transience through utilitarianism. Despite all of the fragments and interruptions placed in each page, there’s a constant rhythm to Here parallel to the constant rhythm underlying wavering moments in Liquid Liquid’s musical compositions. Set entirely within one room, Here documents the evolution of a space over time through moments layered and weaved into other moments. Within Here, McGuire completely disassembles the concept of chronological order to create fragments of time ready to be compiled into neat and orderly collages. Each page of Here displays the date used for each piece of the collage, thus revealing how little or how much people, animals, language, mannerisms, and non-living items such as decor change. Cleverly, McGuire begins the novel with a family’s memories in the room, providing a human-centric perspective of the room in the 20th century and making you suspect that Here may be a graphic novel version of the acclaimed Up Series. However, that suspicion begins to quickly disappear when fragments of prehistoric, pre-colonial, and colonial times begin to interrupt the narrative following the family. Gradually, glimpses into the future begin to appear on the pages next to other moments older in time, and, despite the potentially disorienting shifts and interruptions of time, we begin to develop an overall sense that the world as we have understood it for the past 300 years is only a tiny lapse in the course of the world’s history. Illustrated in the most unassuming color palette and flat drawing style, Here approaches the line of pretension with its grandiose message delivered through its utilitarian illustration and uniquely non-linear yet rigorously organized narrative technique; however, its dry, distant style fortifies the argument of the narrative. With so few lines and figures to become attached to each image, each moment, each object, and each person in time, we, as the readers, better understand the overall capricious nature of existence because we do not have any anchors to attach ourselves to any character or any moment in the narrative. Reading Here feels like you are traveling in time viewing only the life of others without any memories or foresight into our own, thus giving us the distance to reflect and ruminate on the meaning of our own lives in the context of history and time. By constructing an overall mood rather than a narrative with major plot events and characters to complete a story arc, Here encourages us to dissolve any sentiment of hubris. By the end of the novel, we see the past, and we see what the future holds, a future brought about by our own creation of destruction and then atoned for by nature. We have brought about our own end, but alas, nature continues to survive to reinvigorate and repopulate the Earth with life, though clearly non-human again as in prehistoric times. Possibly interpreted as a work of nihilism, Here reminds us that humans are only a small moment in the life of the Earth and universe, and we will most likely be nothing more than a small moment in the course of history like the tyrannosaurus rex or woolly mammoth. Though it minimizes the significance of human existence, Here establishes that message of insignificance through a certain reverence for forces far bigger than human life, making the novel much less dour or pessimistic. Here does not condemn humans (though it does put into perspective the damage we have done to other living creatures); instead, it reminds us that we are an era in the Earth’s history, like eras before and eras to come. Here is less about the concept that everything is nothing and more about the understanding that all life has its own cycle on Earth. Consequently, with this understanding that this human era will one day meet its end, we should not fear death, and simultaneously we should not fear life. Here stresses the fact that we as humans cannot believe we can live forever and change nature’s plans. The only control we have is over our own current actions in our own lives, so we should live life as fully as possible without holding on to too much to our past, without fearing the future, or without overestimating our own strength. For, regardless of how powerful we may think we are now, how much we fear our own future, or how much we ruminate on our pasts, one day, our home will be the grazing field for giant creatures who are the new inhabitants of Earth, and our remains, if we are lucky, will be the soil for future species of blossoming trees, and we have absolutely no control to prevent this all from happening. 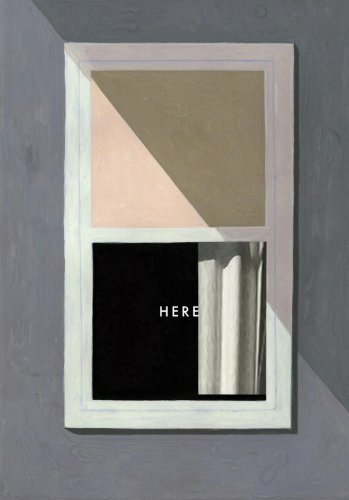 Here by Richard McGuire is available now via Pantheon Books.